Review of 3 best Outlook Email Recovery software given by technical expert according to their prose and cons, download Email Recovery software for all versions of MS Outlook, allows to recover deleted or lost emails. Emails make your communication simple and effective so that your work schedule be kept in pace. Emails are very crucial for working professionals as well as organizations and the most widely used email system is Outlook. If you lose your important emails due to some reasons, what will happen? It becomes very hard to retrieve your emails once they have been deleted permanently. All of your mailbox items become inaccessible. But, don’t worry, there is various software with technical advancement which can be used for email recovery. In most of the cases, the problem occurs due to the corruption of Outlook PST file. So, in order to resolve the issue, You must use an Outlook PST repair software. Well, there are many free and paid email recovery software available in the market. In this article, I will give the review of best 3 software tools. But, before proceeding, I want to explain about the Microsoft’s inbuilt inbox repair tool i.e. Scanpst.exe to repair PST file. Microsoft provides an inbox repair tool that is commonly known as Scanpst.exe. It is an inbuilt repair tool provided by Microsoft that can repair corrupt Outlook PST file. But, as it can fix only header corruption issues, it may or may not be able to repair PST files with severe corruption. In such a case, it is recommended to use a third-party software tool. It is one of the most efficient email recovery tools that are capable of recovering not just corrupted data but also has the ability to restore deleted emails. Backed up with a strong algorithm, the tool scans all the mailbox items present in PST file & recovers them in order. No size limitations of PST file that needs to be recovered. Provided with a feature to save recovered file into multiple formats- PST, MBOX, MSG, DBX, and EML. Featured with preview option to preview the recovered files before saving. Three recovery modes- Standard, Advanced and Deep depending upon levels of corruption. Most pocket-friendly software worth only $49. Compatible with PST files created with all versions of MS Outlook. The only cons of this email recovery software is that it doesn’t support multiple PST files i.e. one PST file at a time. 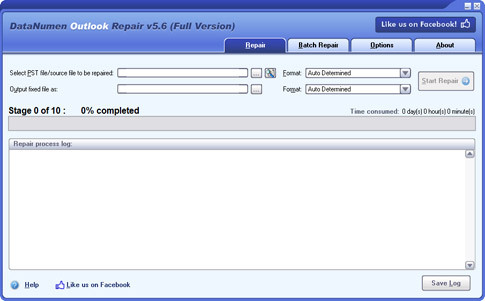 It is also one of the popular PST Repair tool serving thousands of Outlook users. Also, it is having interactive and user-friendly GUI that makes it stand ahead of others. Restores all Outlook mailbox items like Emails, Contacts, Calendars and Distribution groups etc. Snapshot feature is provided to avoid the re-scanning of the same PST file. Search feature to locate any particular email messages from the selected PST file. Regular attachments as well embedded attachments are also supported. 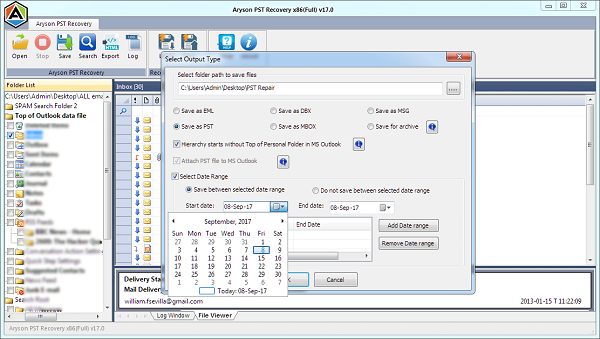 No file size limitations for PST recovery. If corruption is severe, it may take more time in scanning the file. Software doesn’t support a batch of PST files, i.e. only one PST file at a time. One more names come in the niche of Outlook PST Repair tool is DataNumen. It is one of the most reliable and effective email recovery tools available in the market. With an efficient ability to recover maximum possible data from the mailbox folders of corrupt PST files. Splits large PST files into smaller ones. Supports batch recovery i.e. multiple files at a time. Repairs and recovers PST file of any size. Supports to recover outlook email from corrupt media devices such as floppy, zip disks and CD-Rom. Very costly compared to the competitors. Sometimes the recovery rate is slow. 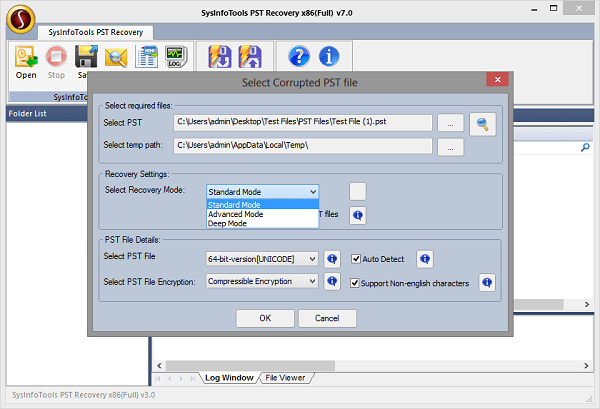 In my opinion, the above-mentioned software is the best for the people who want instant recovery as these software recovers and restore corrupt PST files most of the times. You can also use some other software which is good to go but with a lot of competition and similar products with similar features, it is very difficult to find a reliable PST repair tool. I have shared my personal experience after doing a lot of R&D and recommended above-mentioned software. I hope this article would help the people having issues in email recovery. I have shared what I feel. If you have any suggestions regarding the same, feel free to comment.